Created in Paris and historically made from equal parts tomato juice and vodka, Bloody Mary cocktails are enjoying a resurgence in popularity due to the demand for tasty, high quality drinks to accompany brunch. Bartender Fernand Petiot is credited with first crafting the Bloody Mary and since then, the drink has taken on a variety of interpretations. Today, Connecticut’s awesome local bars and eateries offer up both traditional and creative spins on this classic cocktail. Here are the 10 best places to get a Bloody Mary in the state! The Engine Room is a hip, hopping spot for lunch, dinner, or Sunday brunch. 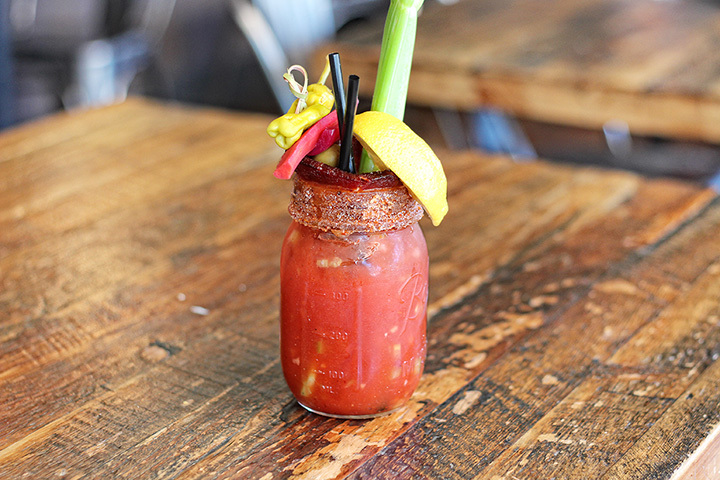 They’re known locally for their boozy Bloody Marys that are a meal unto themselves. Drinks can be topped with anything from the standard celery, to pickles, olives, peppers, and salty cheese. If you stop by for their “boozy brunch,” you’ll be treated to an ever-changing menu of favorites such as Eggs Benedict, donut holes, chicken and waffles, and more. Plan B’s burgers and sides served at lunch and dinner are definitely noteworthy, but their Sunday brunch takes this popular meal to a whole new level. Try their over-the-top Bloody Mary, which is stopped with celery, olives, and a cheese burger slider! They’ve got the spices perfectly balanced in this Bloody Mary, and have turned it into an essential hangover recovery meal by adding the vegetable and burger toppings. Another popular Connecticut spot for brunch, the Oak Haven Table & Bar has taken their brunch menu beyond the classics including shakshouka, breakfast risotto, and grapefruit brulee. As you’d expect, they’ve taken their breakfast drinks menu to the next level as well, with a variety of excellent cocktails. Their Blood Mary is one to write home about, with homemade seasonings, a jalapeno lime rim, and a topper of pickled vegetables and house made bacon. The Stand is an unapologetically cool spot with vintage and upcycled décor, communal seating areas, and a bustling environment. Come by for brunch to enjoy a customizable Bloody Mary, with a smoked pepper and paprika rim. Choose to add bacon, corn bread, a chicken wing, or other tasty toppers to your drink. Alternatively, the Stand also features a bloody margarita, which is tequila, orange and lime juice, and spiced tomato juice. Tisane is a cool café serving teas, coffees, and light meals such as flatbreads, salads, and soups, all with a European-Asian fusion. Stop by for brunch, enjoyed outside on their terrace, and be sure to order one of their several Bloody Mary options. If enjoying a drink on your own, opt for the Bloody Texan, which is a Mary with barbecue and whole grain mustard, or if you’re dining with friends, share the Bloody Sunday Vessel, which is a pitcher of your choice of Bloody Mary. For food, there are vegan and vegetarian-friendly options such as a tofu scramble. Another eye-catching menu item is called Newly Departed, which features bacon, peanut butter, and banana jam stuffed into bread and toasted with peanut crunch and honey. The Oyster Club is notable for its farm and ocean to table mission, sourcing ingredients from a ton of local farms, fishers, and cheesemakers. For their weekend brunch, the Oyster Club offers diners two Bloody Mary options: the classic and the briny. The Briny Bloody Mary incorporates their house made tomato juice, Suze liqueur, pickle juice, and a salted rim. For yet another boozy brunch spot, visit Walrus and the Carpenter in Bridgeport. Their typical meat-centric menu follows to their Sunday brunch, with options like pulled pork Eggs Benedict, Kansas City Breakfast, and chicken and waffles. As far as drinks go, their bottomless Bloody Mary will keep you sated until long after brunch. And, if you’d like to level-up your drink, opt to add a rib or two, and you’ve got yourself a meal. Providing a classic pub-like atmosphere, the Ginger Man makes diners feel welcome with a menu full of comfort foods. Open for brunch, they serve up their classic Bavarian soft pretzels, chicken wings, eggs Benedict, and huevos rancheros. For drinks, they’ve created their own special blend of spices to compose the Ginger Man Bloody Mary. Continuously voted as one of the best pubs in Connecticut, the Corner Pug doesn’t disappoint visitors with its food or its drinks. Also open for Sunday brunch, the Corner Pug features delicious entrees like banana foster pancakes, shrimp and gritz, and a veggie frittata. To accompany any brunch dish, they also offer a house made Bloody Mary. S&P Oyster is a long-standing favorite in southeastern Connecticut, particularly among diners who love fresh seafood. The menu at S&P Oyster is extensive, with numerous fish and shellfish dishes on the menu for both lunch and dinner. No matter the time of day you visit S&P Oyster, you can also order their “Surf & Turf” Bloody Mary, which features a spicy, homemade tomato juice, and is garnished with an olive, slice of bacon, and lobster tail or shrimp. Now that is a decadent drink.